| caption= Shawnee native with spear. The Shawnee natives were in Ohio in the 1600s. They were fierce warriors, fighting with the French until the French trading posts turned British. They fought with the British against the Americans during the American Revolution. Tecumseh tried to reunite the Native American Tribes, but was defeated by General Anthony Wayne in the Battle of Tippecanoe in 1811. Between 1831 and 1833, the U. S. Government sent the Native Americans to live in Oklahoma. | caption= Shawnee with spear. The Shawnee were in Ohio in the 1600s. They were fierce warriors, fighting with the French until the French trading posts turned British. They fought with the British against the Americans during the American Revolution. Tecumseh -- a leader of an Ohio band of the Shawnee who organized a pan-tribal resistance movement against the Treaty of Fort Wayne -- tried to reunite the Native American Tribes, but was defeated by General Anthony Wayne in the Battle of Tippecanoe in 1811. In 1817, under the treaty of Fort Meigs, Ohio Shawnee -- joined by some Seneca -- were sent to live on three reservations in Northwest Ohio. Between 1831 and 1833, following the defeat of the Tecumseh resistance movement, Ohio-based Shawnee continued to organize to resist removal from their lands by the U.S. government. By the mid-1830s, via the U.S. Government's policy of forced removal of American Indians West of the Mississippi, most Shawnees were relocated to reservations in Oklahoma and Kansas. Shawnee with spear. The Shawnee were in Ohio in the 1600s. They were fierce warriors, fighting with the French until the French trading posts turned British. They fought with the British against the Americans during the American Revolution. Tecumseh -- a leader of an Ohio band of the Shawnee who organized a pan-tribal resistance movement against the Treaty of Fort Wayne -- tried to reunite the Native American Tribes, but was defeated by General Anthony Wayne in the Battle of Tippecanoe in 1811. In 1817, under the treaty of Fort Meigs, Ohio Shawnee -- joined by some Seneca -- were sent to live on three reservations in Northwest Ohio. Between 1831 and 1833, following the defeat of the Tecumseh resistance movement, Ohio-based Shawnee continued to organize to resist removal from their lands by the U.S. government. By the mid-1830s, via the U.S. Government's policy of forced removal of American Indians West of the Mississippi, most Shawnees were relocated to reservations in Oklahoma and Kansas. The Shawnee were living in the Ohio Valley as early as the late 1600s. The Iroquois -- also in the area during this time -- were unwilling to share these rich hunting grounds and drove the Shawnees away. Some went to Illinois; others went to Pennsylvania, Maryland or Georgia. As the power of the Iroquois weakened, the Shawnees moved back into Ohio from the south and the east. They settled in the lower Scioto River valley. The Shawnee natives were allies of the French until British traders moved into the Ohio Country circa 1740. The French pushed the British out of Ohio and the Shawnees became allies of the French again until the British victory in the French and Indian War. As French trading posts turned into British forts, the Ohio natives, including the Shawnees, fought the British and their colonists. 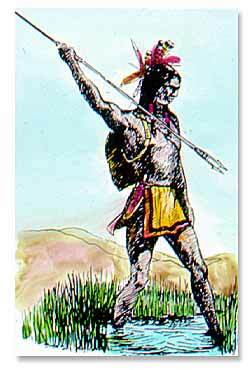 A Shawnee leader named Cornstalk led the Shawnees against British colonists during Lord Dunmore's War in 1774. During the American Revolution, the Shawnees fought alongside the British against the Americans. The Shawnees believed that Britain would prevent the colonists from encroaching further upon the natives' land. After the war the Native Americans continued to fight the Americans. Historical records indicate that European-American colonists perceived the Shawnee to be fierce warriors. Colonists saw the Shawnee to be among the more feared and respected of Ohio's inhabitants. General Anthony Wayne defeated the Shawnees and other Ohio natives at the Battle of Fallen Timbers in 1794. The Shawnees were forced to surrender most of their lands in Ohio with the signing of the Treaty of Greeneville. Many of the Shawnee moved into the Indiana Territory. Some Shawnee, however, hoped to reclaim their Ohio lands. Chief among them was Tecumseh -- a veteran of the Battle of Fallen Timbers -- who hoped to unite together all native tribes west of the Appalachian Mountains against the United States. Due to the advanced technology of the whites and the Native American's failure to put aside their traditional differences, Tecumseh's efforts at confederation failed. General William Henry Harrison defeated the Shawnees and their allies at the Battle of Tippecanoe in 1811. Other Shawnees, like Black Hoof -- leader of a popular Shawnee resistance movement on Treaty of Fort Meigs-appointed lands in Northwest Ohio -- adopted white customs, in the hope that assimilationist efforts would protect the Shawnee rights to these lands. Between 1831 and 1833, the United States forced the Shawnees to give up their land claims in Ohio. The U.S. government sent the natives to reservations in Oklahoma and Kansas. The Shawnees divided themselves into different clans. The principal leader of the Shawnees could only come from one clan. The name of this clan was “Chillicothe.” When a village was called Chillicothe, it meant that it was home to the principal chief, the “capital city” of the Shawnees. Chillicothe was also the name of Ohio's first state capital. Today, descendants of Ohio's Shawnee are organized into several bands. Three federally-recognized bands are incorporated in the state of Oklahoma, including the Absentee-Shawnee Tribe of Indians of Oklahoma, the Eastern Shawnee Tribe of Oklahoma, and the Shawnee Tribe (also known as the Loyal Shawnee), who were previously federally recognized as the Cherokee Shawnee and are descended from the Black Bob band of Shawnee who led a resistance movement on their lands near Cape Girardeau, Missouri. The state of Ohio also recognizes severally bands of Shawnee with claims to land in Ohio, including the United Remnant Band of the Shawnee Nation (recognized in 1979).